I’m sorry. 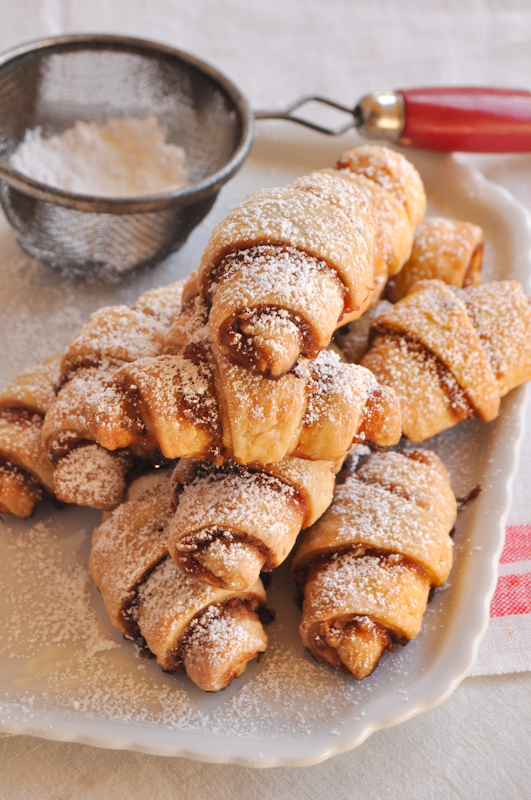 I know you’ve probably reached your threshold for holiday sweets at this point. But I feel like I would be doing you a huge disservice if I didn’t share this with you. 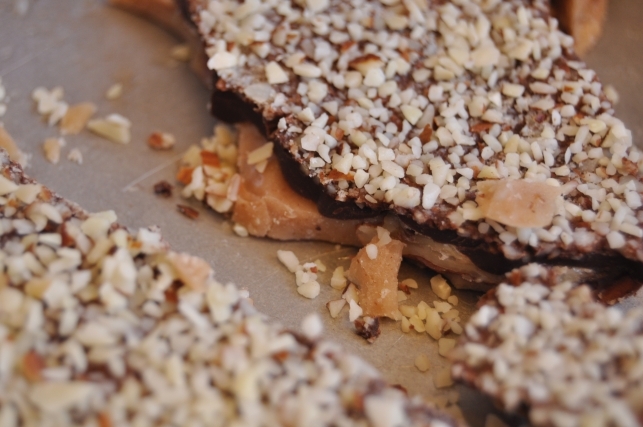 You might already be familiar with cracker toffee. I’ve been making it every year since I first encountered it here. 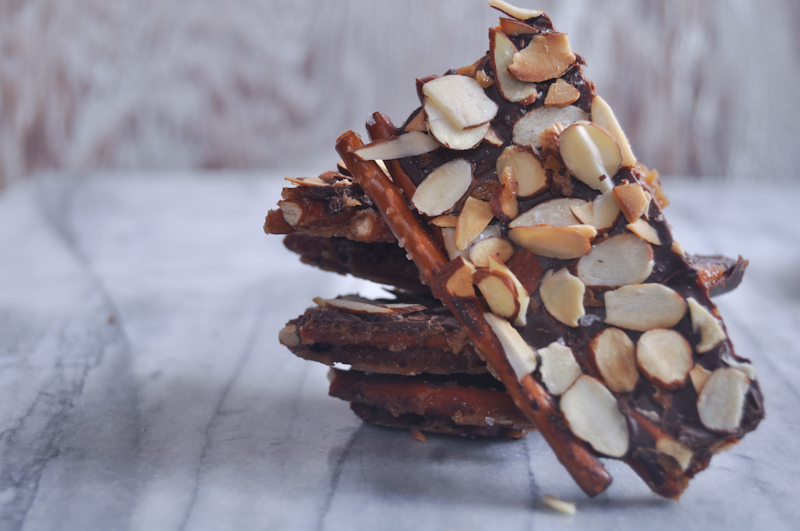 Crackers (saltines or matzo), swimming in brown sugar toffee and topped with dark chocolate, toasted almonds, and sea salt – it is dangerously addictive. 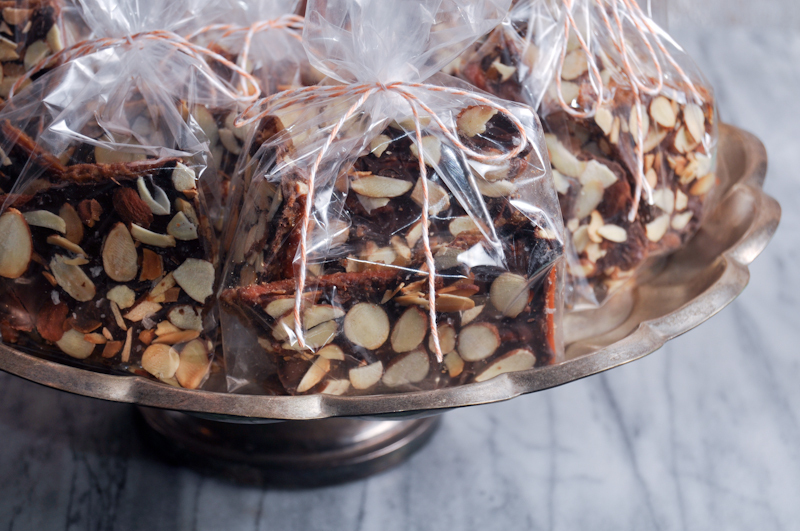 I make at least one batch of cracker toffee every holiday season because people love the stuff. It’s the right thing to do. I brought the matzo toffee to a Secret Santa party last week and the entire tin was empty by the end of the day, which is always the sign of a winning treat. Even though I’ve had it a million times, I had to try a piece (quality testing). As I munched, I started thinking about pretzels. 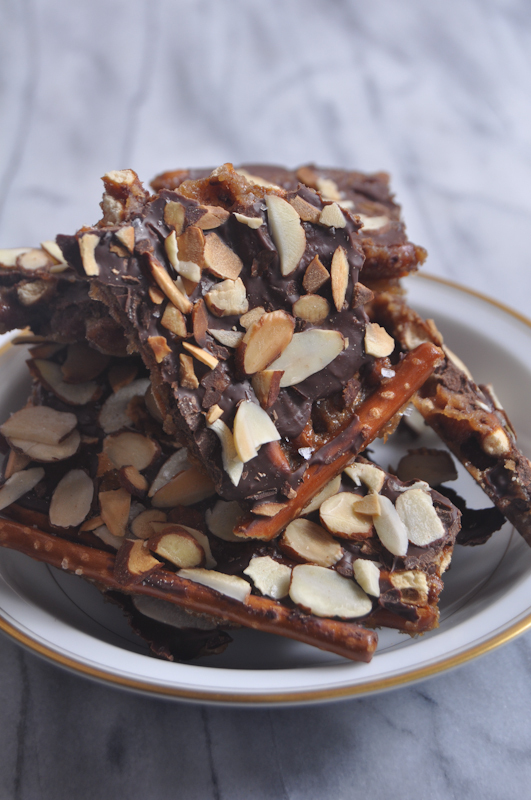 I’ve had pretzels on the brain the past few months, and have been meaning to make a toffee covered pretzel of some sort. And then I realized that the matzo could very easily be swapped out for pretzels. So that’s exactly what I did a few days later. I picked up a bag of pretzel sticks and went to town. I decided that cellophane bags filled with hunks of pretzel toffee were going to be a nice little surprise for the peeps this year. I packed up most of it, but made sure to save a few pieces for myself. 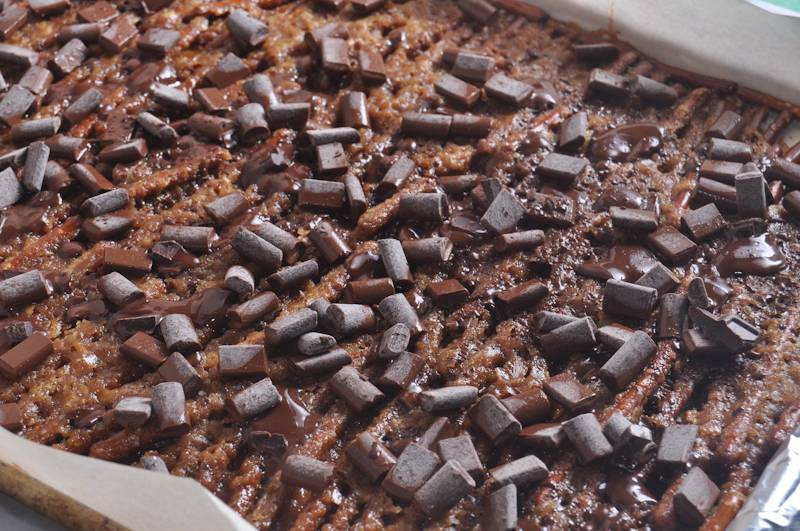 Salty, sweet, crunchy, nutty, chocolatey – all the bases are covered. Just do it. 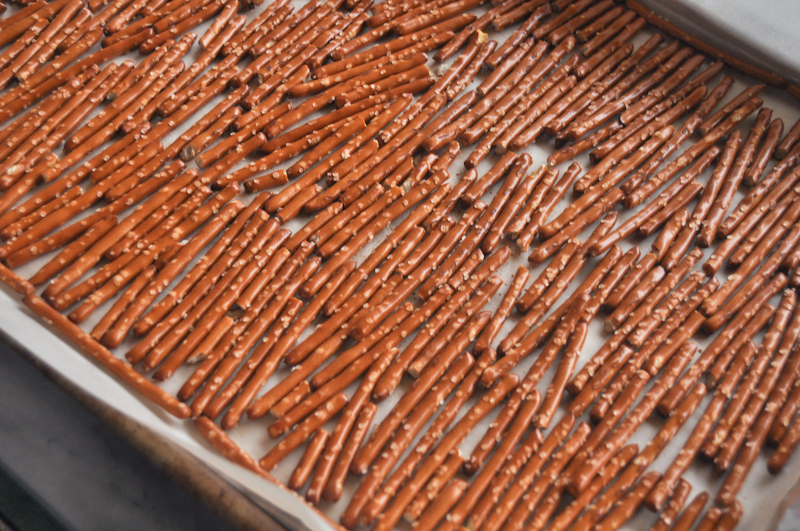 Line the bottom of the baking sheet with pretzel sticks, covering as much of the pan as possible. In a medium heavy-duty saucepan, melt the butter and brown sugar together, and stir it over medium heat until it begins to boil. Once it has begun boiling, let it bubble for three more minutes, stirring it well. It will thicken a bit as it cooks. Remove from the heat and add the salt and vanilla, and then quickly pour it over the pretzels. You’ll want to spread it quickly, as it will begin to set as soon as it is poured. Bake the caramel-covered pretzels for 15 minutes, watching carefully as it will bubble and the corners might darken too quickly and/or burn. You can reduce the heat if you see this happening. 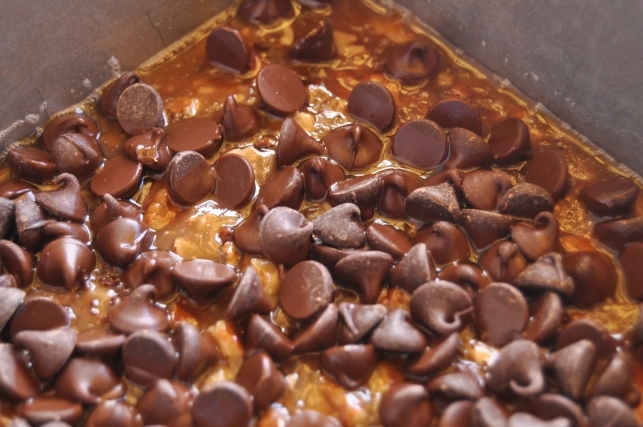 Remove from oven and immediately cover with chocolate chips. Let stand five minutes, and then spread them evenly across the caramel. An offset spatula works great here. If you’re using them, sprinkle the chocolate with toasted almonds and/or sea salt. 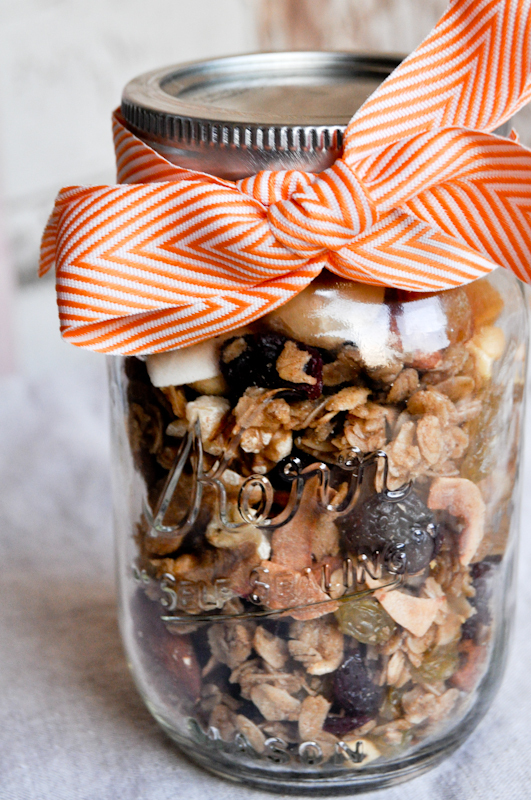 Once completely cool, break it into pieces and store in an airtight container. As promised, a recipe for candied orange peel to go along with that pumpkin layer cake. If you’re a citrus person, you will love candied orange peel. It’s the grown-up version of Orange Slices, the orange-shaped gummies that you find at gas stations and the candy aisle of Walgreen’s. Real candied orange is a little less sugary and just a touch bitter with a pure orange flavor. 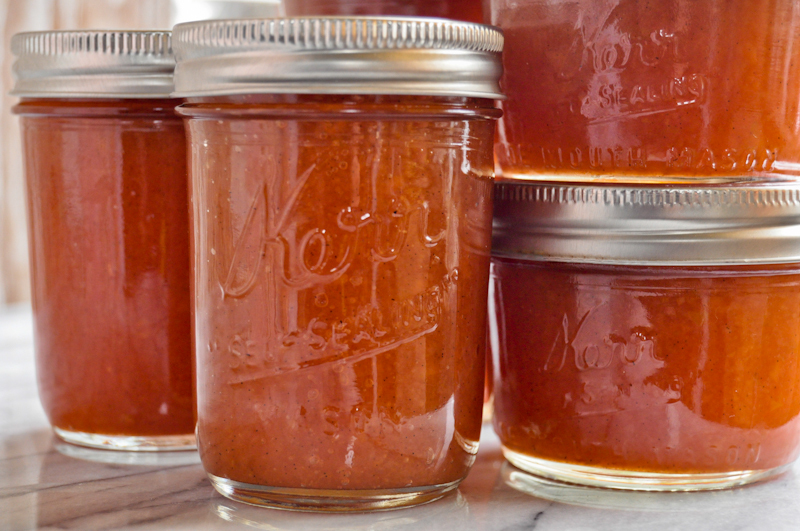 In my opinion, homemade candied orange is far superior to what you’ll find in most stores. And it’s easy to make with the help of a candy thermometer. And a little bit of patience. Speaking of candy thermometers, I’ve graduated to the world of digital candy thermometers. I broke two glass thermometers this past year, so I figured I would go digital. I chose this one based on its ability to read a broad range of temperatures, which makes it perfect for tempering chocolate, deep frying, and candy making. I absolutely loved the candied orange on the pumpkin layer cake, but I think it would also be a really lovely served with a chocolate cake, or maybe even a custard or pudding. It adds a nice contrasting texture and citrusy brightness. And the sugar coated orange is very pretty when sliced thin. You might also consider dipping them in melted dark chocolate for orangettes. Totally addictive. And the perfect late afternoon pick-me-up or after dinner treat. Cut tops and bottoms off of the orange and score the orange into quarters, cutting down only into the peel and not into the fruit. Peel the skin and pith of the orange in large pieces, use the orange for another recipe. 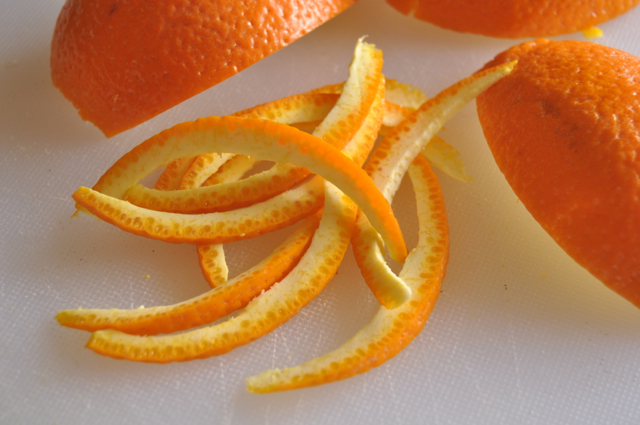 Cut the peel into strips about 1/4-inch wide. Put the orange peel in a large saucepan with cold water to cover, bring to a boil over high heat. Then pour off the water. Repeat 2 more times. Remove the orange peels from the pan. Whisk the sugar with 3/4 cup water. Bring to a simmer and cook for 8 to 9 minutes. If using a candy thermometer, it will be at the soft thread stage, 230-234° F. Add the peels and simmer gently, reducing heat to retain a simmer. Cook until the peels get translucent, about 45 minutes. Resist the urge to stir the peels or you may introduce sugar crystals into the syrup. If necessary, swirl the pan to move the peels around. Remove peels from syrup and transfer to a plate of sugar (save the syrup for ice tea). Roll the peels in sugar and dry on a rack for 2-4 hours. Return to the sugar to store. Prepare a parchment lined baking sheet and set aside. Place 2/3 of the chopped chocolate in a heat-proof bowl. Place over a pan of simmering water and stir often, making sure not to let any steam or moisture come in contact with the chocolate. Continue until chocolate is completely melted and has reached a temperature of 110-120°F. 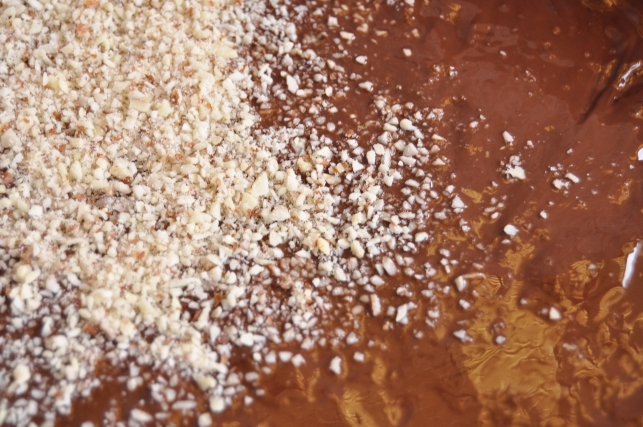 Remove from heat and add the reserved chocolate and stir until it cools to 90°F. Dip candied orange 2/3 into melted chocolate and let the excess drip back into the bowl. Place the dipped peel on the prepared baking sheet. Repeat with the remaining peels. Leave dipped peels on the lined baking sheet until the chocolate has set. Carefully remove the peels from the parchment and transfer to an airtight container. Halloween is less than a week away and I’m without a costume. I have serious love for Halloween, so not having a costume (or plans) makes me feel like I’m dying inside. I did manage to buy six – yes, six pairs of false eyelashes from the craft store last weekend. So if nothing else, there will be crazy eyelashes this Halloween. And popcorn balls. 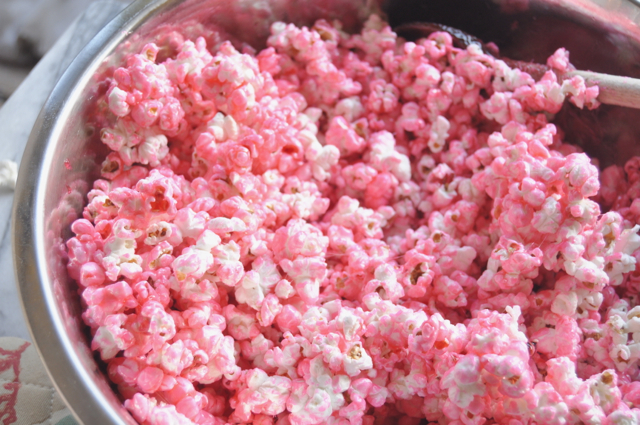 Make that pink popcorn balls. One of my favorite childhood treats was Wright’s Pink Popcorn, the sweet, slightly stale bar of popcorn sold at zoos and amusement parks in and around the Bay Area. My mom would buy it for us at Fairyland when we were kids, so I associate youth and good times with pink popcorn. Spray a large mixing bowl with non-stick cooking spray. Pour the popped popcorn in the bowl and set aside. Combine sugar, corn syrup, butter, and salt in a small, heavy saucepan. Stirring constantly, bring the mixture to a boil over medium heat. Continue stirring and boil for 2 minutes. Remove the sugar mixture from heat and add baking soda, vanilla, and food coloring, stirring, until desired color is reached. Pour the hot syrup over the reserved popcorn; stir together with a wooden spoon until all the kernels have been well coated. Spray your hands with non-stick cooking spray. Working quickly, use your hands to form a 3-inch-diameter ball. Transfer the ball to parchment paper, and let cool completely. Repeat with remaining the popcorn mixture. 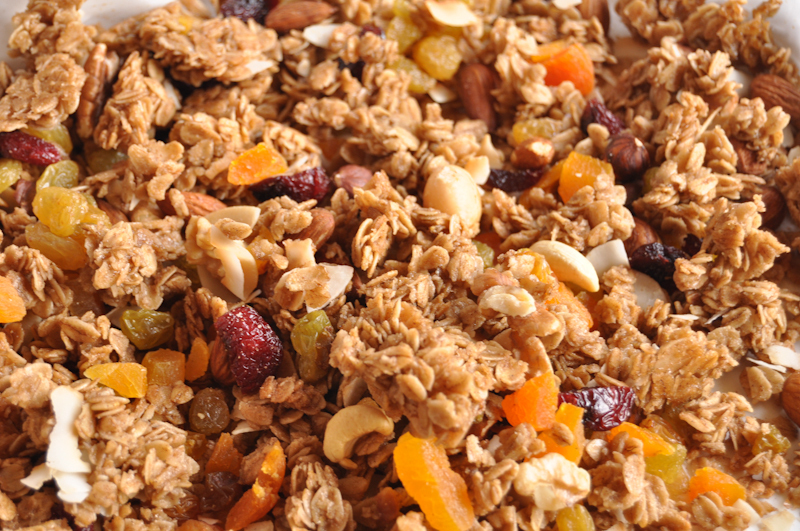 Wrap individually in plastic wrap or store in an airtight container up to 2 days. I really took it to heart when I heard someone say that this is the time of year for the Earth to rest. It’s not that I’ve actually done much resting, though I do like the idea of rest, but I have taken a bit of a break. Part of it had to do with my oven being out of commission. And I also burned out a little after all of those pies I made for Thanksgiving. But the holidays are officially here and I’ve been really anxious to get back in my kitchen. Let’s talk about marshmallows. I like marshmallows. As an adult, I don’t typically find myself eating plain marshmallows. But when combined with other ingredients, marshmallows are one of my true loves. I love s’mores and rice krispy treats and scotch kisses and rocky road. These goodies would be nothing without marshmallow. After buying a package of fancy marshmallows at Whole Foods last year, I decided that I needed learn how to make my own. And when I saw the marshmallow recipe in the Baked cookbook, I knew it was time. Let me just say that eating a homemade marshmallow makes you feel like you’re eating a marshmallow for the first time. It’s like you’ve never had a marshmallow in your life prior to that moment, like those jet-puffed marshmallows you stuffed in your face as a child weren’t even marshmallows. Homemade marshmallows are soft, fluffy, and perfectly squishy and melty when you put them in your mouth. They make you say, ” OMG,” out loud, like it’s a reflex. 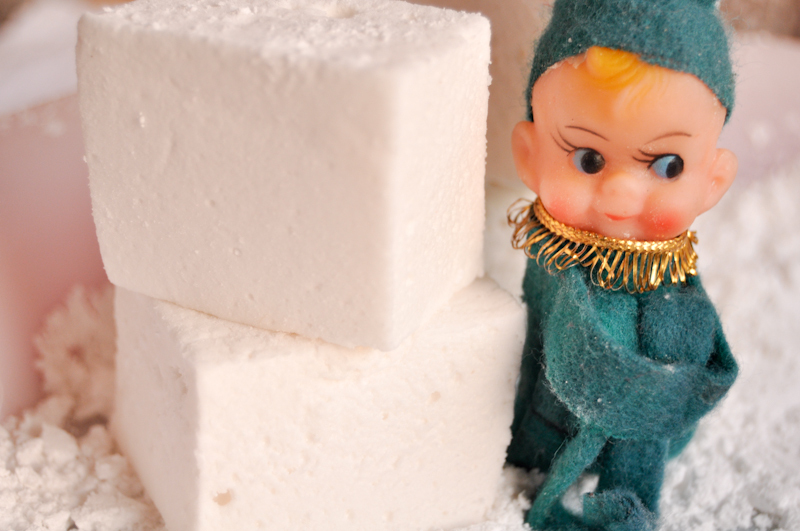 Making your own marshmallows is surprisingly easy, especially considering the payoff. The hardest part was waiting the six hours for them to set – I was dying to sample them! If you want to impress yourself and your loved ones this holiday season, make some marshmallows. I know I will. I can’t wait to distribute these bad boys. And I also can’t wait to throw one in a bowl of hot cocoa. Grease a 9x13x2 inch pan with vegetable shortening. Set aside. Fill a medium size heatproof bowl with very cold water and ice cubes. Place the gelatin sheets in the water and set aside. In another medium saucepan, add the sugar, 1/2 cup corn syrup, and 1/2 cup of water and stir gently, making sure not to splash the ingredients onto the sides of the pan. Put the saucepan over medium-high heat. Put the remaining 1/2 cup corn syrup in the bowl of an electric mixer fitted with the whisk attachment. Set aside. Check the temperature of the saucepan of water. When the temperature reaches 220°F, drain the water from the gelatin and gently wring any excess water from the gelatin sheets. Place the bowl of gelatin over the saucepan of simmering water and stir until the gelatin is completely melted. Remove the bowl from the pan. Place the candy thermometer in the saucepan with the sugar mixture. Bring the sugar mixture to the softball stage on the candy thermometer, 235-240°F. Remove the candy thermometer from the mixture and remove from the heat. Turn the mixer to medium speed for 1 minute, then slowly pour the sugar mixture into the gelatin mixture. When all of the sugar mixture has been added, turn the mixer to medium-high and beat for about 5 minutes. The marshmallow mixture will begin to turn white and fluffy. Add the vanilla and salt and turn the mixer up to its highest setting for another minute. Working very quickly, pour the marshmallow into the prepared pan. Use an offset spatula to spread the mixture evenly. Sprinkle with a bit of sifted confectioners sugar and let sit for at least 6 hours. Run a knife around the edge of the pan to loosen the marshmallow and gently pull with your hands to remove. The marshmallow will come out in one large piece. Lay on a flat surface dusted with confectioners’ sugar. Place 1/2 cup confectioners’ sugar in a small bowl. Using a chef’s knife, cut the marshmallows into a 6×8 grid. Roll each marshmallow in confectioners’ sugar. Keep in an airtight container for up to 1 week. I don’t know about you, but to me, the holidays seemed just a bit more crazy this year. This past week has been filled with candy making, gift wrapping, pie baking, family functions and so on, and so on. I am spent! I decided early on that this was going to be a happy homemade holiday. I just can’t deal with the crowds and the lines and the department stores the way I used to. I also wanted to avoid staying up until the wee hours of the morning baking dozens of cookies like I normally do every Christmas. So I took the easy route: handmade caramels. Earlier this year I went to a birthday party where a friend of mine brought Ina Garten’s fleur de sel caramels, which were totally the foodie highlight of the day. It’s probably not a huge surprise to anyone that I am an Ina Garten fan. I adore her approach to cooking and entertaining and find her recipes extremely user friendly. So when it came time to think of homemade gifts, it was obvious to go for the caramels. I am so glad that I did! They are surprisingly easy to make and they are so much more exciting and decadent than a cookie. And from what I’ve been hearing, I’m pretty sure the caramel recipients were also happy with my decision to skip the cookies this year. Line the bottom of an 8-inch square baking pan with parchment paper, then brush the paper lightly with oil, allowing the paper to drape over the sides. In a heavy saucepan combine the sugar, corn syrup, and 1/2 cup water and bring to a boil over medium-high heat. Continue to boil until the caramel is a warm golden brown color. Don’t stir – just swirl the pan to mix. Meanwhile, bring the cream, butter, and 1 teaspoon fleur de sel to a simmer in a small pan over medium heat. Remove from the heat, set aside and keep warm. When the caramelized sugar has reached the proper color, slowly add the cream mixture to the caramel – it will boil up violently. Stir in the vanilla with a wooden spoon and cook over medium heat for 5 to 10 minutes, until the mixture reaches 248°F (firm ball) on a candy thermometer. Very carefully pour the hot caramel into the prepared pan and refrigerate until firm. When the caramel is cool, use the parchment paper to lift from the pan onto a cutting board. Starting at 1 end, roll the caramel up tightly until you’ve rolled up half of the sheet. Cut the sheet across and then roll the second half tightly. You will have 2 (1 by 8-inch) logs. Sprinkle both logs lightly with fleur de sel, cut each log into pieces. 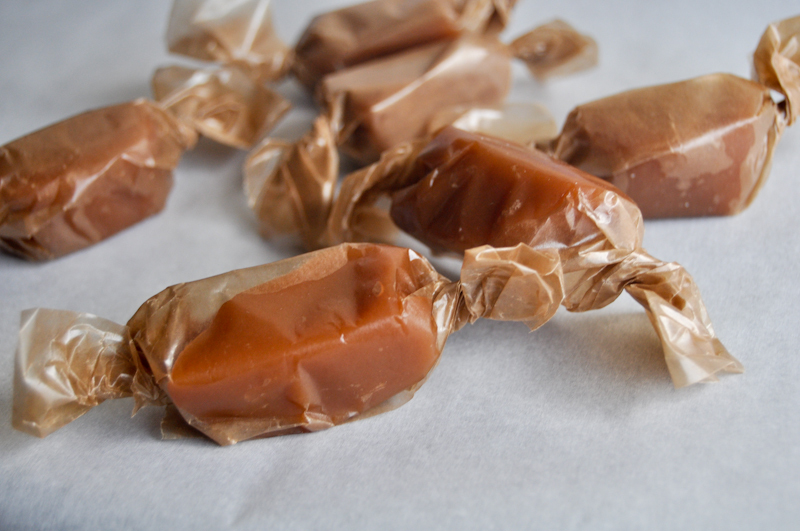 Cut parchment papers in 6 by 4 1/2-inch squares and wrap each caramel in a paper, twisting the ends. Store in the refrigerator or at room temperature.